This season is your last chance to ride Schweitzer's Snow Ghost. I'm sitting in my favorite place on Earth, yet there's nothing warm and cozy about it. There's no white sand, turquoise water or lush greenery. In fact, it's pretty much the opposite of that. It's cold, snowing and the wind is howling. I'm alone in the midst of a winter storm dangling at a dizzying height above the barely visible ground. Between the falling snow, howling wind and what seems to be ever-present fog, I'm lost in thought about how even though I loathed the name change at the time it happened, "Snow Ghost" is probably just about perfect for the beloved Schweitzer Mountain chair lift. This hasn't always been my favorite place; in fact, it began as quite the opposite. Looking back 45 or so years, my earliest memories of riding the old Chair 6 are of sheer terror. As a 6-year-old boy, riding any chairlift inspires the kind of fear akin to a monster under your bed, but in its original location this particular chair was even worse as it seemed to rise almost immediately to a dizzying height. As if that wasn't enough, it also passed right over a marshy bog, which in my mind seemed to always be covered in a steaming mist where undoubtedly hid monsters of an almost unimaginable evil. While I could never say for sure how many times I dangled from my father's death grip on my parka over that misty bog after a botched attempt to load the chair smoothly it surely seems like it was every time. Of course, before long I'd mastered the skill of properly loading the chair, but I never quite escaped that feeling of dread when gliding high above my perceived pit of despair. "Of all the great ski days in my life, an almost unbelievably high percentage of them have involved lap after lap riding on my dear old friend Snow Ghost." As my ability to ski grew so did my love of the sport, but it wasn't until Chair 6 was literally airlifted to its current location further up the mountain in 1988 that I truly fell in love with spending my ski days riding it. With the improved unload now at the highest point on the ridge between the rocky and somewhat open North Bowl and the gloriously steep tree skiing found in the Big Timber/Siberia zone, access to fantastic skiing was unlocked instantly. This simple, yet genius, move now made it possible for the savvy Schweitzer veteran to ski untracked powder for days. Of course, it never bothered me too much either that in its new resting place the loading zone for the chair was nowhere near where my original fears lived. Some have claimed that the extended ride time of the chair now known as Snow Ghost has been its biggest weakness, but I've always found it to be one of its biggest strengths. Sure, in this instant gratification society we find ourselves today, it's not surprising for many to be turned off by a 15-or-so-minute time out, but that's missing the point. If we skiers only ever ride high-speed detachable chairs, can our legs really hold up for a full "bell to bell" day of powder slaying? I've always found one of the bonuses of the slow-moving Snow Ghost experience to be the chance to get to meet my fellow brethren who, like me, find winter to be the most joyous season of them all. I've shared stories with retired doctors whose grandkids now ski these same slopes, met Texans who somehow managed to find North Idaho on a map, learned new lingo from teenagers so fired up about skiing they reminded me why I love it so much, and on perhaps one of my luckiest long rides to the top even shared some priceless conversation with the person who soon became my favorite human and eventually my wife. You just never know what might happen if you simply slow down and enjoy the ride. Of course, there's been ups and downs both literally and figuratively as I've spent a large portion of my life on this most beloved of frigid winter chariots. So far, it's the only chairlift I've ever had to be evacuated from and I know I'm far from the only skier to make that claim. I've spent more time than I'd care to remember gripping that ancient center pole tightly as the wind howled with the chair stopped at what somehow always seemed to be its highest point just before it reaches the relative safety of the midway unload. I've had the misfortune of having my season pass taken from me by ski patrol while enjoying the powder-laden slopes Snow Ghost accesses, twice! Then again, I was once the first person to make fresh tracks here on a glorious powder day and continued to lay down fresh lines right there the entire day until the chairlift staff told me it was time to go home. That's the kind of ski dream nirvana I've found so often here. I've watched the snow pile almost impossibly high on my thighs while ascending through a storm even though my well-designed gear kept me so warm and dry I felt as though I was at home on my couch. Of all the great ski days in my life, an almost unbelievably high percentage of them have involved lap after lap riding on my dear old friend Snow Ghost. 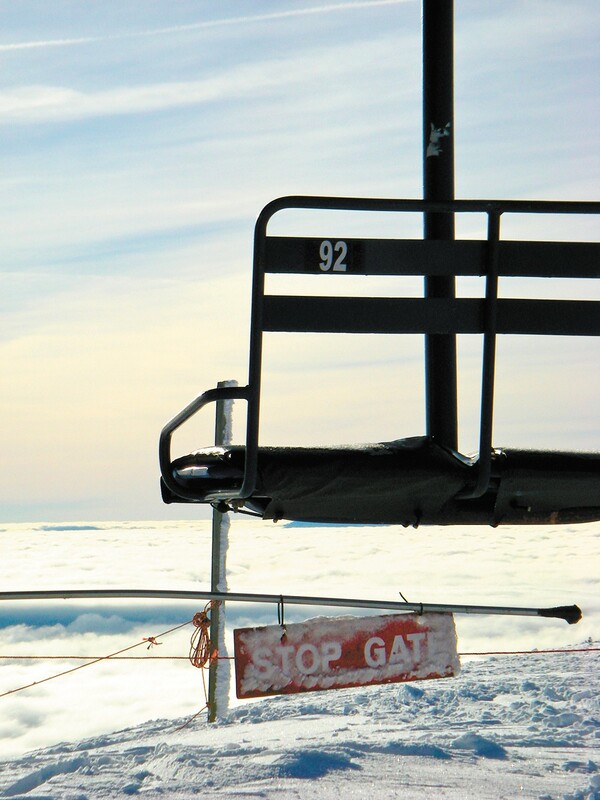 As the saying goes, "all good things must come to an end" so with one eye focused firmly on the future, Schweitzer Mountain Resort has announced this season will be the last for this great chair from which so many fond ski memoires have been made. Where will I be on that fateful day sometime next April when my dear old friend struggles mightily against the effects of time and winds of change? I'll be right there of course taking one last ride, having one last long conversation, taking a long last look around and raising a glass to honor quite possibly the best friend I've ever had. Will tears be shed? Almost certainly. However, they won't just be tears of sadness for the loss of an old friend, they will also be tears of joy looking forward to what new memories I might create on whatever chariot comes around to carry me skyward in the future. The original print version of this article was headlined "An Ode to the Snow Ghost"
Sat., April 20, 11 a.m.-1 p.m.